How do dams impose values on the Colorado River or any other river's uses? Few people ever see this sight or may even be able to experience the view from the bottom of the chasm, thus the argument for the dams went. Two dams on this river above and below the Grand Canyon National Park would not interfere with the greatest number of people's experience of the Grand Canyon's scenic monumentalism. The upper of the two proposed dams was proposed to flood Marble Canyon. At the time of the proposal (1960s) the Grand Canyon National Park property line began south of Marble Canyon, shown in the photo on the lower left. Based on its scenic, archaeological, and importance to native American peoples the opponents of the dam site were able to argue against Marble Canyon being flooded. Every ecological problem has three facets that answer the question of where do environmental impacts alter the assimilative capacity of a particular resource or place. 1: Physical dimensions of the case. 2: Biological conditions of a case. 3: Social characteristics of the case. 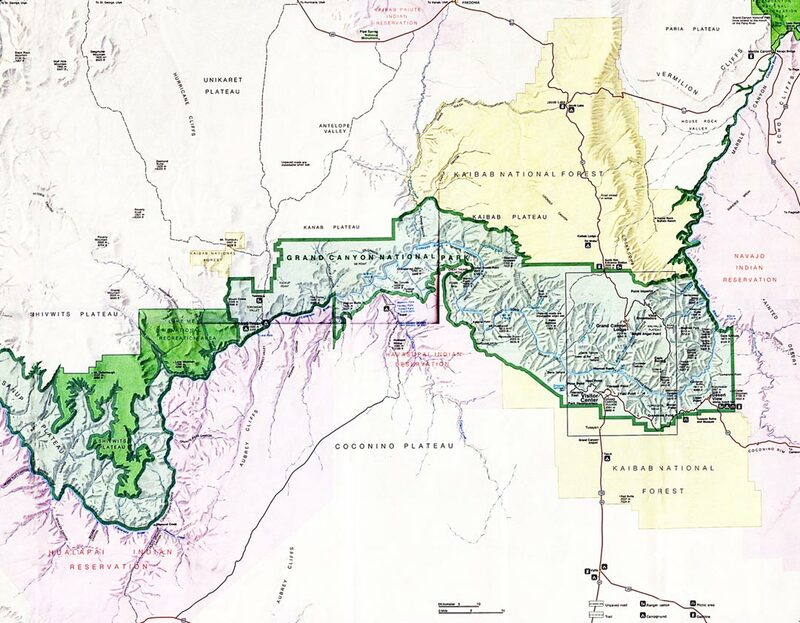 Comprehensive River basin planning influenced the Central Arizona Project. Canyon's converge where the Colorado and the Little Colorado Rivers meet. The red wall limestone of Cretaceous & Permian eras' rocks rise above the juncture. The biodiversity of the Canyon's ecosystems are today threatened by insufficient flooding since the flow of the river is controlled by Glen Canyon dam upstream to provide electrical power for Los Angeles and southern California rate payers. Dams were once a symbol of progress and conservation's promise in the arid west. But as the number and sizes of dams increased their utilitarian function became viewed as an intrusion in an otherwise wild landscape. Colorado River water for the central Arizona project underwrites the state's development, especially mining and suburban land use. Dams across the west produce a significant proportion of the electrical power needed by residents of the southwest, especially in metro areas such as: Phoenix, Los Angeles, Tucson, Las Vegas, Salt Lake City, & San Diego. Electricity is the easiest, cleanest and most effective means of delivering power, but it was not always that way. The term for producing electricity to meet a constant level of need. The amount of power demanded at the least busy time of the day and year. Usually industrial facilities that work around the clock with three shifts of workers require electricity at a constant level of output, though manufacturing plants can vary. This is the term used to describe a spike in demand at busy times of a day or year. Daily there are two spikes or "twin peaks" early in the morning (6 AM to 9 AM) and late in the afternoon and early evening (4PM to 7 PM) when people and commercial users and industrial consumers all demand electricity simultaneously. Their combined demand creates the spike or peak in the need for electrical energy. Water and electricity are partners in creating the world we have come to depend upon for work, services, goods and even recreation. Water is used to make electricity, because turbines that generate a current of electrons are turned by steam. The super heated water flashes into steam and is still hot when it condenses. Cooling towers, seen here on the extreme left of the photograph are used -- as are cooling ponds-- to lower the water temperature so it will not scald living creatures. Electricity is also used to run pumps that move water from the ground into the surface network of pipes, towers, and waste water treatment plants that bring running water to commercial, municipal, residential and industrial users. Base load capacity of the plants is a technical capability of all generators to produce a steady supply of electrical power at all times of the day. Dams generate base load power very inexpensively & can be used for peak load. Peak load is power needed well in excess of the baseload requirement when every customer demands electricity at certain times of the day. A graph of the demand would peak at those hours of maximum demand. Two agencies in competition for limited federal dollars. 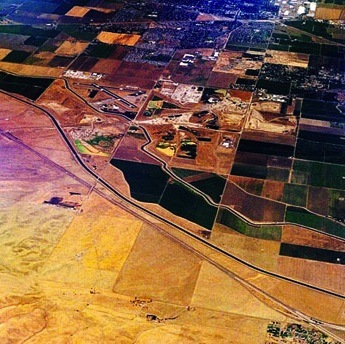 irrigation, reservoirs, levees, dams and canals. Bureau estimated the Colorado River has an annual flow of 17.5 million acre feet of water (1922). built fortifications in the Revolutionary war, 1775 - 83. The canyon is the deepest fissure, cut by a flowing river, in the world. Temperatures swing from 56 to over 106 degrees from winter to summer respectively, at the bottom of the gorge. This immense landscape feature stretches from below the Paria River at Lee's Ferry -- the dividing line between the Upper and the Lower Colorado River basins-- to boulder canyon, since 1928, the site of Hoover Dam. Twenty million people live in the Colorado River basin that stretches from Colorado and Utah to California, Arizona, Nevada and northern Mexico. About 2.4 to 3 inches of rainfall annually collects in the basin, much of the river rises from snow melt in the central Colorado Rockies. Four million visitors annually go to the Grand Canyon National Park (2004). This is the largest river in the southwest. Although it is large, the flow of the Colorado River is but a fraction of the flow of the larger Columbia River in the Pacific Northwest and the Columbia is a fraction of the Missouri and Mississippi Rivers' annual flow. The earth is full of locations where numerous remnants persist of evidence that a previous ecological association of plants & animals existed in prehistory on the same sites. Ancient sea creatures revealed the origins of the limestone that line the towering walls of the canyon. Layers of dinosaurs, beneath layers of flowers are found. From between 3,000 and 5,000 years ago resident people have occupied the Canyon, itself, though the Hopi Mesas to the south reveal occupation to 10,000 ago or more.